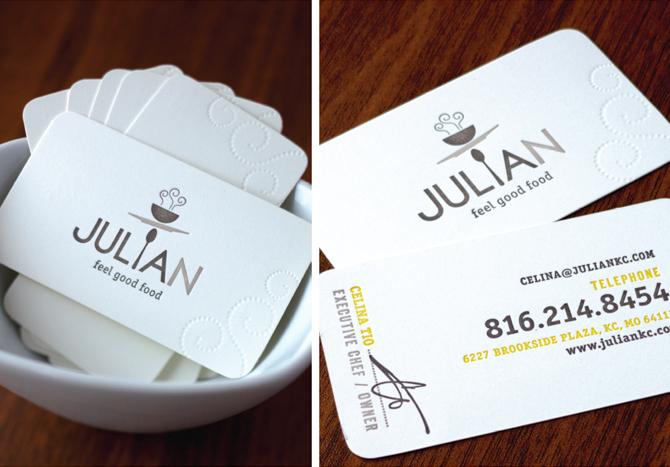 Nathaniel Cooper & Jordan Gray designed these business cards for Julian Restaurant, a neighbourhood restaurant in Kansas City, Missouri. The restaurant features refined twists on familiar comfort food from James Beard award-winning chef Celina Tio. The name ‘Julian’ derives from Tio’s main cooking influences, Julia Child and her grandfather Julian. The design elements took cues from Julia Child’s well-known, well-stocked kitchen. The food are crafted with the finest local and seasonal ingredients, refined with signature twists and served in a comfortably sophisticated atmosphere.  The business card design reflected that, with the logo and ‘feel good food’ slogan. The blind letterpress effect is impressive on the front side. The contact details on the backside is equally thoughtful with the use of well-selected typography and colour palette, not to mention the signature of the owner adds uniqueness to the brand as well as giving it a personal touch and a sense of sophistication. The rounded corners also offer a smooth and modern look! These business cards were letterpress-printed by TwoTone Press in Kansas City, Missouri. This is a clean and appealing design that’s not to be missed!